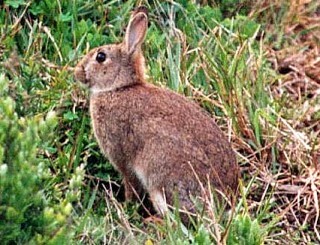 Serrated tussock and rabbits are two of the biggest threats to agriculture and biodiversity in Victoria. Grow West projects aim to reduce the environmental impacts of these pests by putting vegetation back into the landscape, generating competition and altering the conditions in which these and other pest species thrive. 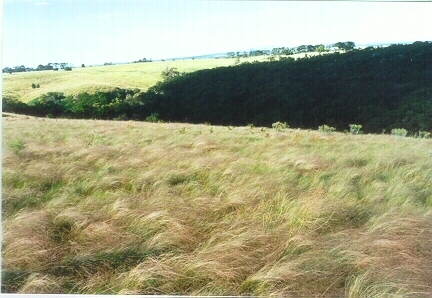 S errated tussock is a perennial grass from South America which infests more than 2 million hectares of land in south-eastern Australia. The weed is unpalatable to most grazing animals, invades native grasslands and, unfortunately, is entrenched and widespread in the Grow West area. The revegetation being undertaken by Grow West is fighting serrated tussock in two ways. Firstly, as the trees grow, they are shading out serrated tussock – reducing both the number of plants and the health and vigour of those remaining; which in turn is reducing the amount of seed produced each year. Secondly, it is creating massive barriers of trees which slow serrated tussock spread by catching airborne seeds and reducing ground level wind speed. Rabbits are considered the biggest feral problem in Australia as they are estimated to cause about $200 million damage a year. Their prodigious breeding rate, as well as their ability to adapt successfully to most Australian habitats, means that a single pair can increase in 18 months to 184 individuals. Rabbits are a serious threat to the health of landscapes in the Grow West area as they destroy many of our native plants. A study in September 2007, looking at the effect rabbits have on remnant native vegetation on farmland in south-eastern Australia, found that rabbits severely reduced tree and shrub recruitment on over 25% of the sites studied. Other studies have shown that as few as three rabbits per hectare can stop regeneration of some native species particularly native Cypress-pines and acacias. Rabbits are the most destructive where soils are fragile and prone to erosion once ground cover is removed. These types of soils are abundant in the Grow West area. The preferential grazing behaviour of rabbits also promotes the dominance of woody weeds such as boxthorn; briars and blackberry and their presence in the landscape sustain fox populations. Grow West projects help control rabbit populations by stimulating landholder investment in rabbit baiting, warren destruction and harbour removal. Landholders who partner with Grow West must reduce rabbit populations to less than three per hectare to ensure that seedling survival is maximised. Mature Grow West plantings significantly reduce the impact rabbits have on the landscape. Land that is covered by trees and shrubs is less habitable to rabbits and vegetation cover reduces the severity of erosion caused by rabbit activity.